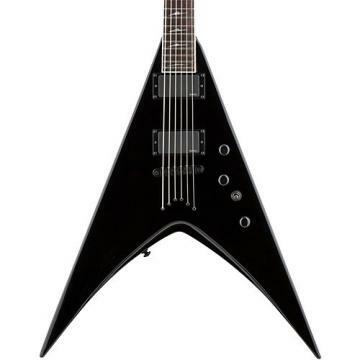 The ESP LTD V-401B Baritone Electric Guitar combines captivating looks, solid electronics and deep tones. The mahogany V-shaped body features a maple top and set-thru maple neck for maximum stability. The lightning-fast fast neck sports a thin-U neck profile with a rosewood fingerboard and 24 extra-jumbo frets. Active EMG 81 pickups provide the power you seek with a 3-way switch and individual volume and master tone controls. Black hardware includes a tune-o-matic bridge and precision Grover tuners. Case sold separately. This is the best guitar I've ever owned. The balance is perfect. I used to prefer a Floyd Rose, but the string through body is awesome. The Grover tuners are precise and sturdy. Output jack is high quality, no buzzing, and in a great location to loop it through your strap. The set neck was done so well, that it could easily be mistaken for a neck-through. Sustain is excellent. It easily holds a b tuning for death metal, etc. But I chose to run .010-.046 and tune to E std for thrash. The tension is almost the same, so I didn't even have to adjust the truss rod. I may replace the nut, however, because the smaller strings are a little sloppy in the grooves cut for .013's. That being said, it didn't affect the performance or tuning stability in any way. The binding is beautiful. Neck edges are nice and smooth. The only thing I thought was strange it that ESP chose to put dual EMG 81's in it. Most EMG equipped guitars run a 85 in the neck, but I only use the bridge anyway, so it didn't affect my playing style. I like having dual volume controls, so I can leave the neck low and just click up to tune, down to play. Overall, a professional instrument at a working musician's budget.